Talk, Text, Take Photos . . . and Stop a Bullet! Technology is an essential tool in crime prevention and when tracking suspects after a crime is committed. From cell phone records and GPS monitoring to mitochondrial DNA testing and clues left by sloppy posting on social media sites, developments in science and engineering have afforded members of law enforcement tools they could not even have imagined only a decade ago. In my series of novels featuring vigilante crime solver Emily Stone, my protagonist uses the latest offerings in surveillance and communication to track her dangerous prey with great success. What about us everyday folk on the street, though? What does all this technology mean for our personal safety? Sure, our smart phones are handy if we need to call 911 or maybe take a quick and discreet photo of someone we catch acting on the wrong side of the law. We even can track where our teenagers are at midnight on a Friday. 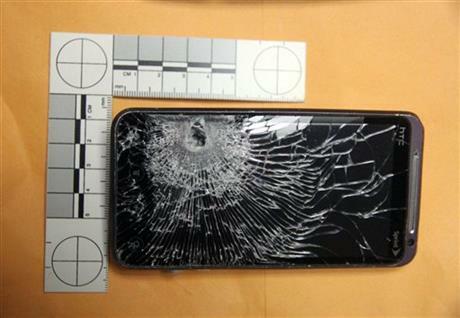 But did you also know that apparently our smart phone can stop a bullet? At a gas station in Florida last week, a man with a gun demanded two clerks open the store’s safe. When both employees were unable to do so, the would-be robber fired a single shot and ran out of the store. It wasn’t until emergency crews arrived and one of the clerks complained of chest pains that this clerk realized he actually had been shot. The smart phone that he had placed in the chest pocket of his shirt had saved his life. I am not suggesting that we all purchase enough cell phones to serve as our own shields of armor, although that would be an interesting look. It is interesting to think, however, that the phone we always need clutched in our fingertips to check our latest text messages or sports scores really may be of better service covering our heart or head! Forensics and Criminology: How’d They Do That? This entry was posted in crime, Forensic and tagged award winning, bullet, cell phone, cell phone armor, crime, crime prevention, dead burn, emily stone, emily stone series, forensics, gps, jennifer chase author, mitochondrial DNA testing, mystery, robbery, smart phone, smart phones, stop a bullet, text messages, thrillers. Bookmark the permalink. 2 Responses to Talk, Text, Take Photos . . . and Stop a Bullet! In olden days this would have been a book 🙂 I guess I need to get me a smart phone now as I’ve been resisting this technology!